This is a great photo of Barack Obama's good luck charms. * a tiny Madonna and child. It's been many years since I dabbled in palmistry, but his palms look easy to read! Very distinct lines. Saw http://bleacherreport.com/articles/7510 ... onship-run and thought it was interesting: "Jimmie Johnson: NASCAR's Mojo Master Uses Hoodoo For Championship Run"
"Mojo Master", "master of the ancient art of hoodoo", "a passionate fan of the belief system", "his early years of hoodooism", "Chad and team members were seen rubbing hoodoo mineral oil throughout the inside of the car", "after rubbing the hoodoo crystal that he had embedded in his driving gloves", "their most sacred hoodoo charm, a red flannel cloth bag filled with petition papers asking for race victory", "consulting the charm [mojo bag]", "use another hoodoo symbol, a ginger root, which he waved directly at Hamlin's Fed Ex car". 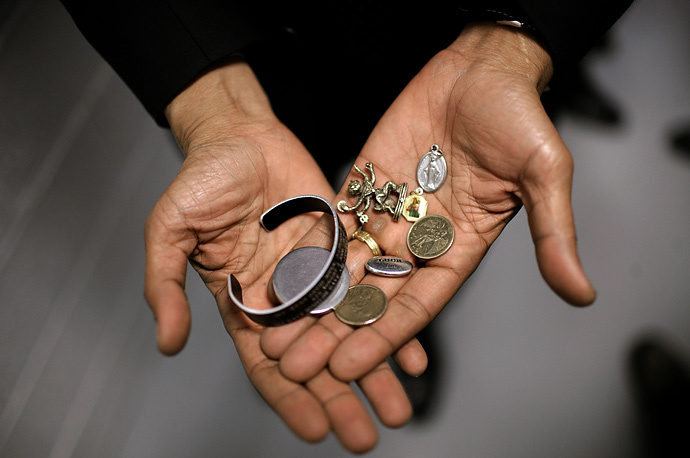 Could someone list President Barack Obama's charms shown here? Jessica Simpson had a curse put on Tony Romo? Re: Jessica Simpson had a curse put on Tony Romo? The article quotes it from The National Enquirer, so take it with a grain or two of salt lol. Or a whole pound, lol. Lots of salt, but it made me laugh. * A pewter ovoid stamped with a word; I think it is "Inspiration," but I cannot quite make it out. * A printed-paper-under-glass medal of the Virgin with Baby Jesus. * A golden Guardian Angel coin. This is the same as one that Lucky Mojo carries. Are there any rootworkers here who have famous clients (without naming names, of course)? I've often wondered if Jennifer Lopez's mom was into Santeria or something since she hit the lottery twice, if I recall. It would be really unprofessional, in my option at least, to talk about things like that, and its comes very close to bragging. Understood. If anyone takes offense, I appologize. Does anyone recognize any of these charms? Interesting, I wanted this information and cross check if LM sells any of them. Some of them are appealing...some strange...some curious. For example, I like the oval cross engraved stone...what type of stone is it? * The "monkey" god is an amulet of Hanuman (known also as 'Anjaneya' (son of Anjana) or Maruti (or Maruti nandan), one of the most popular concepts of devotees of God (bhakti) (devotion to God) in Hinduism, and one of the most important personalities in the Indian epic, the Ramayana). * Lucky Mojo definitely sells that same Guardian Angel coin. It is one that has been popular for a couple of decades. The image is from "The Black Pullet." Thank God or Goddess we finally have a political leader who is willing to admit he is not a hypocrite. MIraculous Medals are common, most of the time you don't even have to buy them, just go to the church office and ask if they have any spare. You'll probably come out of it with a Rosary too. 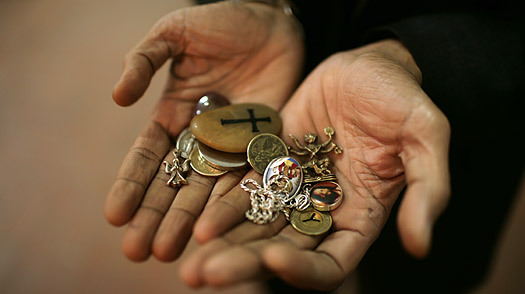 A common trick that is SUPER popular in the Northern states which verges on hoodoo is to bury Miraculous Medals on the property of an enemy who you know is guilty of a crime, and eventually their conscience will cause them to cease or they'll get put up to the authorities. Miraculous Medals are the most common Catholic amulet you can find, if you must buy them they're usually available in any Christian bookstore, Catholic or not, at a range of prices. Some places have a big bowl of them available to purchase large amounts of. Chapels of Perpetual Adoration usually have a few for free on the prayer console near the door. * In the second photograph, there is a little pendant with an Indian-looking bearded man on it. it's a color photograph, which suggests this might be a living man revered as a saint by Muslims or Hindus. I'm not absolutely sure, but I think this is Ravi Shankar; not the sitar player, but a Hindu spiritual leader who is also doing much practical work. He founded an NGO which has UN consultative status. Serious practical charity, it looks like. There's a Wikipedia article on him, for starters. I wanted to play devils advocate..
but before i do that.. Suppose I wanted to go through the motions with acting and directing motion picture films, Is there a way were I can use roots and hoodoo to get the finances to get funded for a A-list movie? Or. If i wanted to be an Actor/Actress, and I wanted to get the status of say, Angelina Jolie, or Will smith, or any body who is A-list, like Oprah. What could I use to invite the spirits to help me and position me to make it come true? Or if i wanted to be a U.S. Senator, or If I was Mitt Romney, and I wanted to beat Obama, and i came to Lucky Mojo, what could i use if he wanted to win and make it become a reality? Or If i wanted to go into the stock market, and I have the formula, and I wanted to buy businesses, and run hedge funds? I know these are silly questions.. I'm sure Miss Cat respects the privacy of her clients and customers and doesn't reveal their identities. I suspect that many politicians and celebrities use magic to help themselves along. Of course, we really have no way of knowing. You could certainly use hoodoo for any type of career and financial success, but you would need some actual skills (or rich parents) in the physical world too. You really should stop saying these are silly questions. A lot of us wonder the same things. thats probably why their magic doesnt work..
but you need skill, luck and hard work.. and that luck is the spirits!! There are spells for fame. They can be effective, of course. Asking about such spells is not playing "the devil's advcate" in any way. Nor is it "silly." And Mama Micki is right: i do not reveal the names of my clients, whether they are poor or rich, unknown or famous. They trust me, and i keep that trust. But let's look at your "silly" question. You started with the premise "suppose i wanted to go through the motions." You can't perform magical work -- for fame or love or money or health -- by merely "going through the motions. It is not a role-playing game. So ... "going through the motions" would avail you nothing. Read Isaiah Chapter 58 -- a most powerful indictment of the futility of "going through the motions." If you understand that Bible portion, you will understand why we do not "go through the motions" in prayer or in magic. atr seeker wrote: If I was Mitt Romney, and I wanted to beat Obama, and i came to Lucky Mojo, what could i use if he wanted to win and make it become a reality? If you knew how many psychics have been on the Whitehouse payroll, it would blow your mind. The two that I know for sure that had psychics on 24 hour standby (and 6 figure incomes for that position) were the Reagans (Jean Dixon) and the Clintons (Jean Huston). Then again McKenzie King used to have seances in order to talk to his dog. A quick Google came up with the following presidents as having personal psychics. I'm sure the list is much larger. Many of us work for celebrities and politicians alike. Living close to Hollywood and having some political connections myself, I work with both celebrities and politicians, offering retainer services. However, I value the privacy of my clients and cannot reveal anything other than you'd be surprised by the number of both groups--or their wives--involved in hiring the services of a spiritual worker. As for Jean Huston, I wouldn't really consider her a psychic, I don't believe she considers herself one. However she certainly is involved in metaphysics, especially New Thought concepts. Good conversation and I agree with the group...asking is never considered 'silly' here in the forum. You want knowledge, here is where you come to get it. Interesting post about the good luck charms. I also remember the psychic twins being on the Tyra Banks show awhile ago and admitting that they worked for the pentagon, but wouldn't go into detail on it. I wonder if there is any idea of how many practitioners of Hoodoo/Conjure there are today? I would imagine it would have been much harder to ascertain a number in years past, and perhaps it still is a difficult question to answer, but this is something that really just piques my curiosity. MojoGuy365, I would be very surprised if accurate figures were available. Aside from the usual difficulties of definition (who gets to decide what is and is not "hoodoo"? By "practitioner" do we mean only professional rootworkers? ), there is the fact that many rootworkers, especially those who only work for their friends and families, are very much under the radar -- by choice and by conviction. Thank you for the response, Miss Michaele, I thought that would likely be the case since it is a folk practice and much more intimate and personal. Thank you again! Here is 2016 video of President Obama showing his current array of lucky charms. They change all the time!